The Enormous Room from Stopgap Dance Company returned to stages this February, following its 2017 London launch at the Lilian Baylis, Sadler’s Wells. Beginning at The Point in Eastleigh, the company will continue touring throughout February and March and into the Autumn too. Featuring David Toole, whose achievements and skills as a disabled performer have been widely influential, plus newcomer Hannah Sampson, the pair are a father and daughter living through their own, very different experiences of grief. Dave’s wife Jackie has died, but he still sees her everywhere. She is lying in his bed, sitting at the kitchen table and laughing with their daughter Sam. Dave has withdrawn into the living room unable to let his memories go. Sampson is a young dancer with Down’s Syndrome who has been in development with Stopgap for over 10 years. As well as a prominent solo at the 2012 Paralympic Opening Ceremony, David Toole came to public awareness via DV8’s The Cost Of Living. He’s renowned as a dancer and has been groundbreaking in terms of dance and disability for over a decade as part of Stopgap Dance Company. The interactions between Toole and Sampson demonstrate their onstage chemistry, which has been evident since initial rehearsals and workshops of this work. They are joined by non-disabled dancers Amy Butler (rehearsal director of Chotto Desh by Akram Khan) and Meritxell Checa (collaborator with Philippe Decouflé), who take the roles of Jackie as Sam’s mother and Dave’s wife respectively. 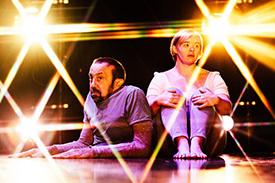 Lucy Bennett, Stopgap’s Artistic Director and choreographer for The Enormous Room, chose to have two performers play Jackie to illustrate the subjective nature of memory. The Cambodian wheelchair dancer Nadenh Poan plays Chock, a Puck-like presence who orchestrates the collision between this world and the next.